Pinterest is an amazing social sharing site that can bring massive traffic to your blog. It can be used to share contents as well as storing blog images. Integrate your website with Pinterest to exploit the benefits of photo sharing site. Social sharing plugins may not be enough to meet your requirements sometimes. A social media follow button or a social feed is useful to exchange followers in between blog and Pinterest. In this post, we pick the 10 best Pinterest plugins for WordPress. It is a simple plugin to add a Pinterest follow button in the sidebar of your blog. You are able to customize the widget title, button size and add multiple buttons for different user accounts. This is another Pinterest plugin from the same developer. 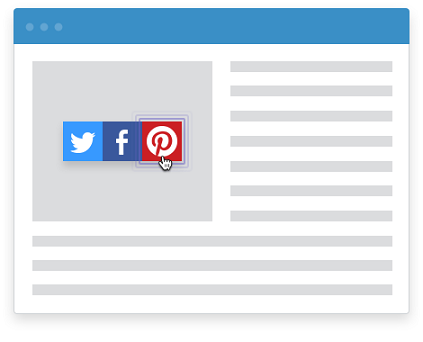 It will show Pinterest Pin It button on image hover, posts, and pages to encourage readers to pin your blog contents on their Pinterest boards. The plugin is customizable with relating to button color, size, and location. You can show or hide buttons on specific content types and devices. Sharing images on social sites is the best method to create instant viral traffic to your blog. Sumo Image Sharer will show buttons on your images – top, bottom, left or right – and lets readers share images on their favorite social media accounts. It supports Facebook, Twitter, Pinterest, and Yummly as of now. Feed Them Social is not just a Pinterest plugin. It allows you to display photos and videos from Pinterest, Facebook, Instagram, Twitter, YouTube and Vine accounts in WordPress. Feed Them Social provides a great way to create social feeds of your favorite celebrities, family, friends, and business. It allows you to insert Pinterest boards and pins in WordPress posts, pages, widgets along with like and follow buttons. Pinterestomatic is a premium Pinterest plugin for WordPress. 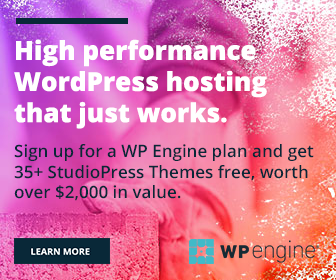 It will automatically import your posts from WordPress to Pinterest and vice-versa. Whenever you publish a blog post, the plugin will create a corresponding pin with your post image and pin it to the board you decide. It allows you to set rules to import posts from the photo-sharing site. Any public Pinterest content can be imported- from a certain user, board or search term. You can also set a maximum or minimum length for the post title, content and assign categories either automatically or manually to them. Pinterestomatic is a great tool to divert more social media traffic to your contents and expand the network of your audience. 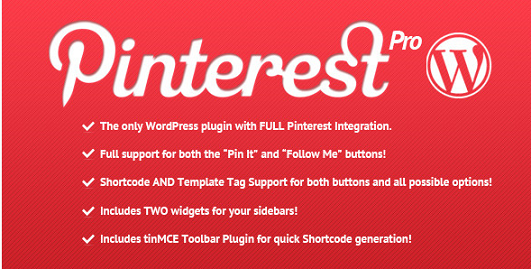 Pinterest to WordPress plugin is another premium product from CodeCanyon. 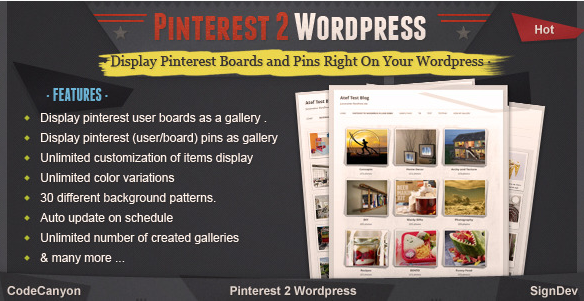 It provides different ways to showcase Pinterest boards and pins in WordPress. Over 30 different background patterns are available with unlimited customization options, color variations and an unlimited number of galleries. The plugin will automatically update the feed at scheduled intervals and display photos from any public Pinterest board. Set the height, width, and margin of items to adjust your page size and web layout. It is a simple Pinterest plugin to quickly pin your blog post images to Pinterest. If a user mouse hovers an image, the plugin will show a Pin button over it and lets users save the image on their favorite Pinterest boards. It is a light-weight plugin and you can enable or disable buttons on certain posts, pages, and image types. This Pinterest plugin comes with two buttons- Pin it and Follow. The website owners can insert them anywhere on the site using a shortcode, template tag and in the form of widgets. It is easy to use and customizable in terms of button size and counter options. 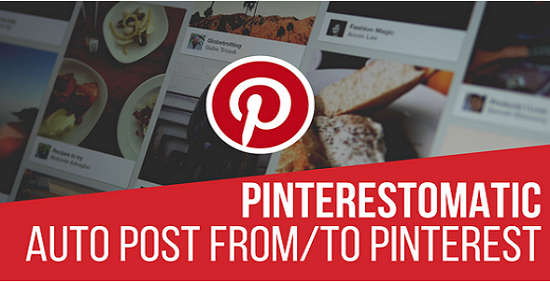 It is a great Pinterest plugin to easily pin your post images as they publish. Once you installed and activated the plugin, you will see a new sidebar menu in the WordPress post editor with the name Pinterest Automatic. It will show thumbnails of all your post images and you can choose an image that you want to pin to your Pinterest account. That’s it. 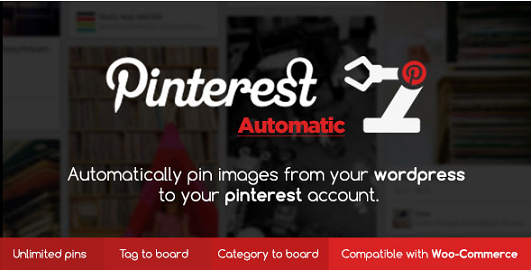 Pinterest Automatic will pin the chosen image as soon as you published the content. AccessPress Pinterest is an all-rounder plugin for WordPress users. It is simple, light-weight and consumes a few seconds to finish the setup. The plugin adds Pin it, Follow buttons & ability to show pinboard and profile widgets, latest pins feed in WordPress. It works with shortcode and widget options. Are you using any Pinterest plugin on WordPress? Let us know your thoughts and feedback through comments.